10th August: The early bird only just caught the worm when we went to check out from Cavtat at 6:30 this morning. We were surprised to see just a small gap remaining on the end of the customs quay as a huge powerboat got in just before us to the bigger space. But the space being on the end suited us as it left us plenty of room to wiggle our wonky way backwards and use the dinghy to push Emerald straight. We ended up blocking a trip boat but hoped they wouldn’t be leaving too early. Colin headed off to wait for the port office to open at 8am and by 8:08 he was back aboard after being stamped out there and then to the police. A minute later we were gone, boats already moving in to take our vacated spot. Phew, that wasn’t so tough and we didn’t pay the line handling fee as he hadn’t been there when we arrived. It was worth an early start. It was a rolly motor with wind at 30 degrees. As we passed the large radar station near Molunat a customs RIB buzzed us with two guys aboard. A larger customs boat sat lurking in a cove. Good job we checked out properly! Around the corner into the Bay of Kotor and it was time to change courtesy flags before continuing on to the customs quay at Zelenica. 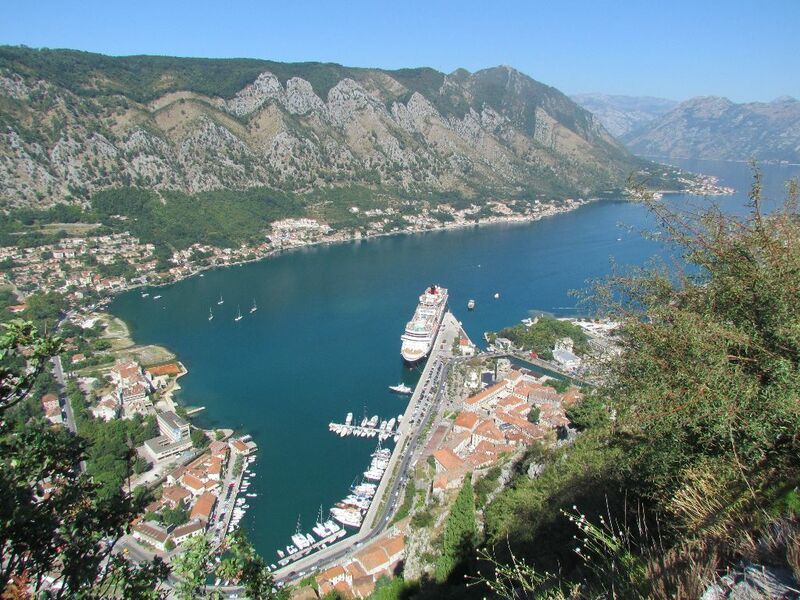 Emerald now has a permanent reminder of Montenegro from the Zelenica customs quay. When we arrived the wind had picked up to a gusty north-westerly, pushing us onto the large, black rubber fenders lining the dock. The fenders left black marks down the port hull which even after plenty of scrubbing are still there. Emerald’s hull paint is now so old it’s become powdery and if we rub it too much it falls off leaving bald patches. A hull repaint is on the job list for sometime in the future. Check in was smooth and effortless, we paid for a month (€95) to give us options depending on the weather. Two bright red stickers were issued to fasten on either side of the mast and we even got stamps in our passports. 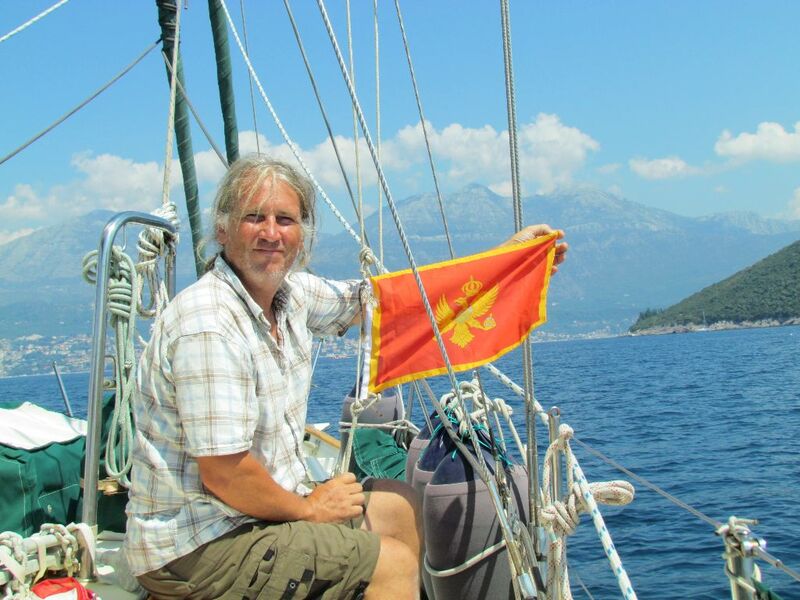 From there we continued on to an anchorage off of Tivat and shared a few beers with Conquistador who provided us with lots of useful information about Montenegro. 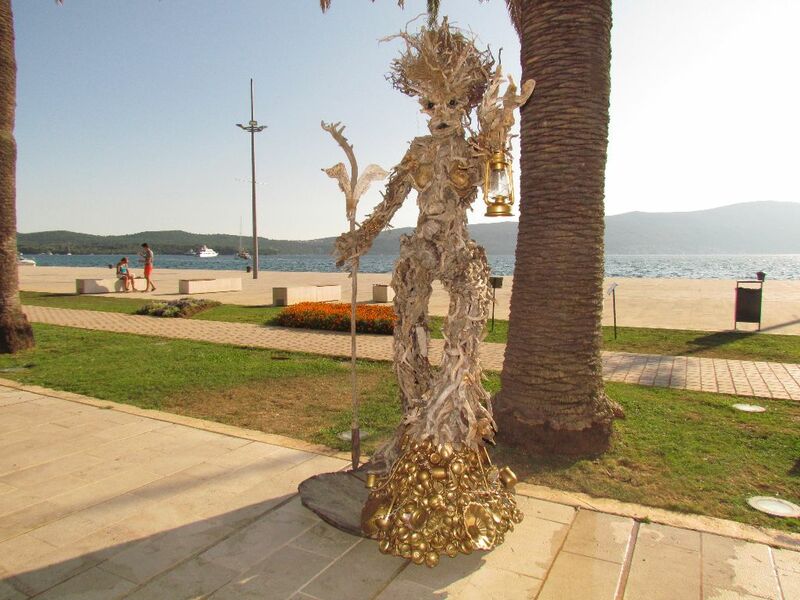 Tivat is the home of Porto Montenegro, a glossy, gleaming marina chock full of wealth. There was a chandlery but most of it’s products revolved around cleaning and polishing your boat; useful for all the superyacht crews but not much good for us. We were able to wander around the quays and get up close to the megayachts and marvel at just how huge the gulf is between the wealthy and the rest of us. Although sheltered from the prevailing wind a chop sets up at Tivat in the afternoon and along with the bar noise well into the night we were driven to find a quieter spot behind Sveti Marko, the Russian owned island, for a Friday evening G&T. We had a F5 blowing now and the strain on the windlass of pulling up the anchor against the wind caused it to give up mid anchor retrieval leaving poor Colin to haul in 25m of chain and a 27kg anchor hand over hand. He was exhausted poor thing! Around the back of the island we found much calmer conditions and picked a spot. Unfortunately when we settled back the man on a close by boat looked unhappy with where we were. We decided to move so Colin set to again manually hauling in. Halfway through the other boat left! Argh! A huge catamaran also started hovering around us trying to get a space too. We ignored them as best we could, picked a spot right in the middle and dropped again. By this time the G&T feeling has passed. Windlass repairs occupied the next morning (the circuit breaker had given up) and by afternoon several other boats from MdR had arrived making it a sociable couple of days. We’d heard mixed reports about anchoring off of Kotor; some boats had been turned away, others had anchored there fine for several days. We decided to take our chances and even if we were moved on we would have had ourselves a private tour of the fjord. The scenery is spectacular. The mountains rise almost vertically up the sides of Europe’s southern most fjord, an ancient river system. The first part of our trip passed through the narrowest section, 340m wide, and criss-crossed by ferries. We spotted 5 on the move at once which really did make it feel like trying to pass through the jaws of death in a computer game. 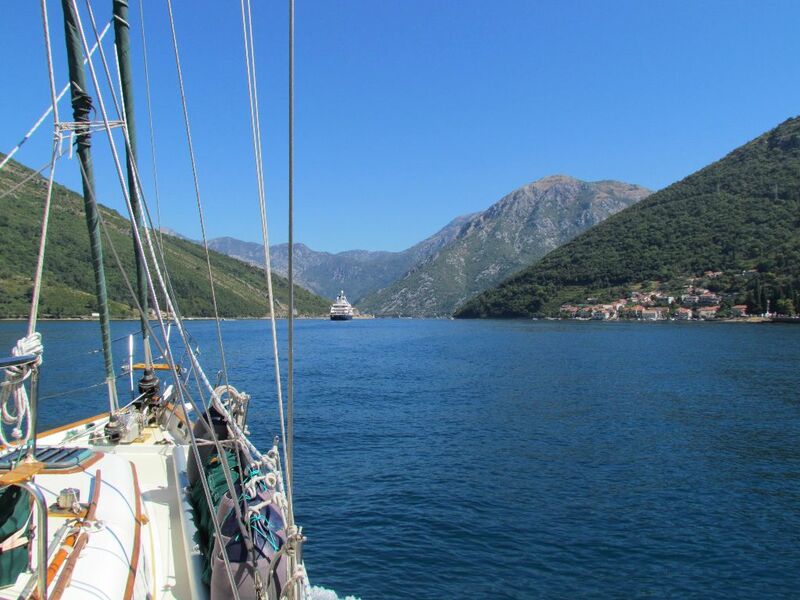 We made it safely through and turned to starboard with more stunning scenery to delight us on our way towards Kotor. One boat was anchored already so we picked a spot nearby and dropped into 12m. Plenty of chain needed and plenty of swinging room needed too. 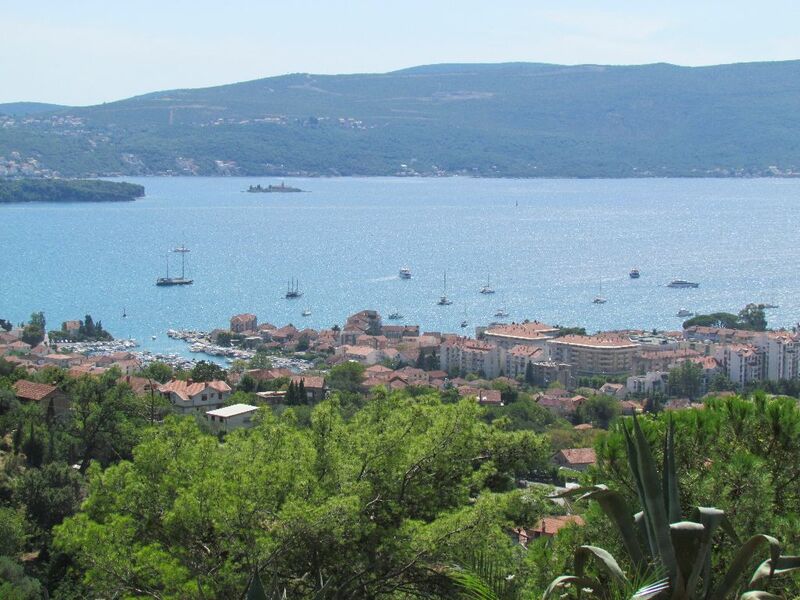 We headed off ashore for a wander around the town, it being too hot for climbing the walls. Touristy yes, but still a delightful town to wander the narrow lanes and alleys, admiring the beautiful architecture. We managed to find the least touristy bar and settled down to people watch and celebrate 8 years since Colin ‘retired’. Several hours later we enjoyed a beef stew at a restaurant outside the walls and rounded off the evening flitting between live bands performing at the bars and restaurants. The next morning was an early start to head up the walls whilst it was still relatively cool and before the cruise ship groups arrived. We got most of the way to the top whilst the mountain was still in shade but it was still a hot slog. 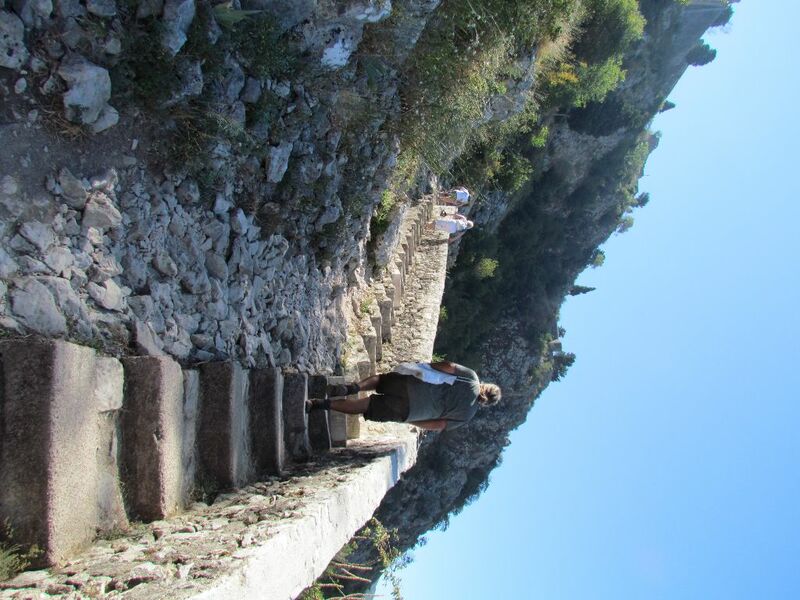 The many zigzags and the steps make the journey up a little easier and my legs weren’t quite as jellified as when we walked up the Walls of Ston but still we made the most of the places where we could take a rest and enjoy the views. Emerald looked like a tiny toy boat way below us. 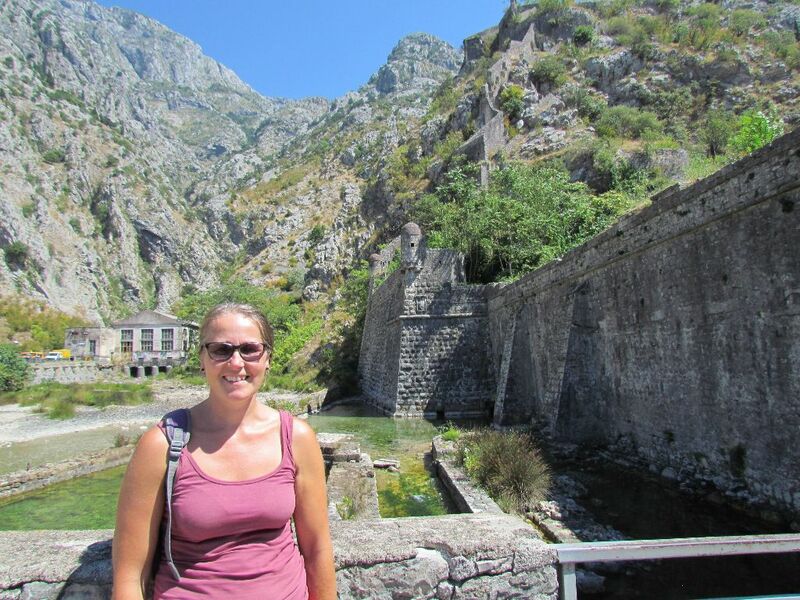 We stayed that night at Kotor before heading on around to Risan. A dinghy trip to the church island turned a bit soggy as the wind picked up on the nose on the way there; it then blew us all the way back to Emerald. We visited the small museum at Risan with some Roman mosaics, the small town used to be a bustling Roman port. 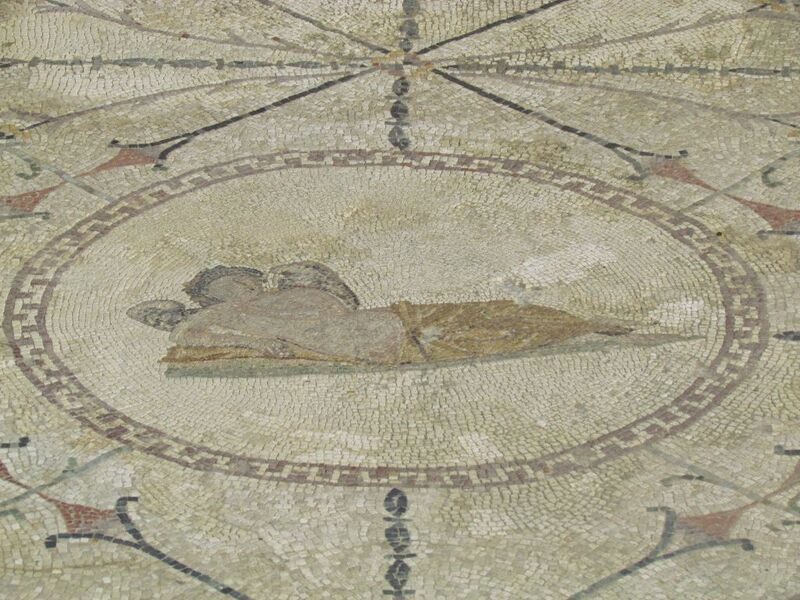 Although the ruins mosaics are described as being of a villa, it turns out the building was actually a house of pleasure! 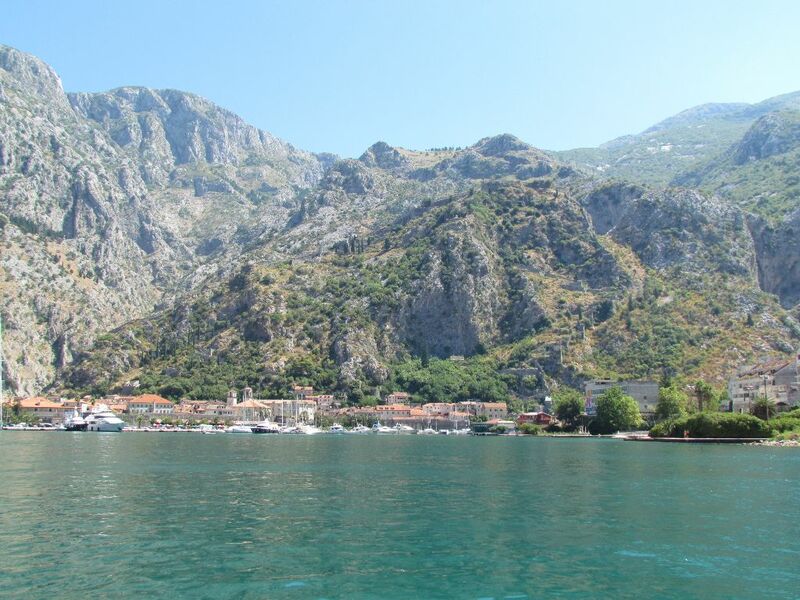 I do love mountains and the Bay of Kotor is surrounded by them creating a striking backdrop. 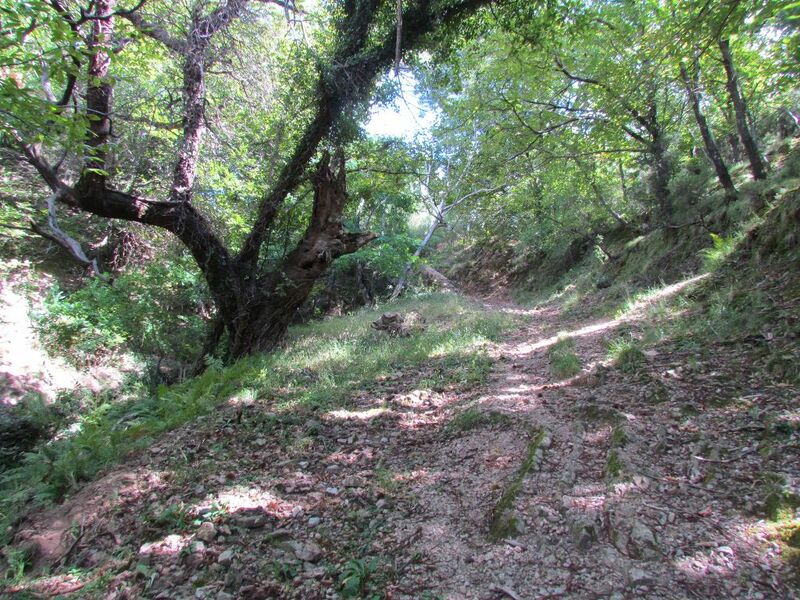 Behind Tivat runs a ridge called the Vrmac and we found a leaflet in the tourist office detailing serveral walks. Our first walk took us up, up and up a road at the top of which there should have been a path, but no path was to be found. We backtracked and finally found a properly marked route which headed into shady woodland. Unfortunately we’d headed out much too late in the day and had to turn back fairly soon but it was wonderful to be out into countryside. A few days later we tried another walk marked on the leaflet. We found the start of the path but were disappointed that there were no red and white stripes or bullseye markers like we’d had on the first walk. We continued on but came to a fork. We guessed which way to turn but after a short way the path fizzled out in a wood. Back to the fork and took the other direction which seemed more hopeful. But again after a while this too fizzled out. With a bit of scrambling we found another path but every time they fizzled out or clearly went in the wrong direction. We ran out of time again and headed back to Emerald to prepare for our trip to Corfu. Prices: we found grocery prices to be comparable to Croatia. Eating and drinking out was a little more expensive, particularly in the tourist areas. We enjoyed Montenegro and would have happily spent more time there if we didn’t have pressing need to make some repairs to Emerald. The people we met were friendly and there was a relaxed feel to the place. The only negative is their love of loud boom-boom music well into the night. Even at Risan which seemed to us like a sleepy, locals town with a population of mostly elderly people, at 11pm a loud beach disco started up and finished at 4am!